Along with roofs, it’s a good idea to have gutters inspected at least twice a year. 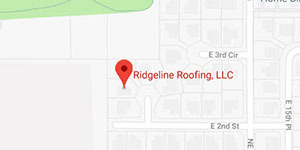 Licensed roofing contractors like Ridgeline Roofing have the skills and resources to work on gutters with the same expertise that they bring to any roof project. In the Northwest, it’s especially challenging to keep our roofs free of damage, moss, algae, debris, and moisture. So, partnering with licenced roofing specialists for inspections, cleanings, and maintenance is the best way to keep your home and your investment protected. Plenty of roofing companies offer guaranteed work, but our first-class services extend beyond the final product. Our business’s core values include keeping the client informed and providing high-quality materials and positive experiences. No matter the scale of the project – from routine maintenance to large-scale installation of gutters and entire roofing systems, we take care of our customers. Though the internet is full of information regarding average prices for gutter installation and replacement, take your findings with a grain of salt as contractor’s estimates will vary slightly. 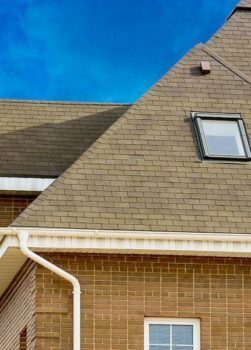 Home Advisor suggests that the 2018 national average for gutter installation or replacement is around $940 with the low end at a surprising $200 and the high end upwards of $10,000. Given the massive variance, prepare yourself for the actual cost by measuring your current roofline, researching material types, and leaving room for the x-factor – labor costs. Gutter material prices a slightly more predictable. Again, be wary of prices you see online as your gutter contractor works with suppliers who offer industry discounts. That said, vinyl and aluminum gutters, downspouts, and connectors are most common in the Northwest and the average homeowner will spend between $4 and $12 per section. Hangers – These are optional but add strength to your gutters. Great for windy areas. Gutter Guards – Keeps leaves and debris from collecting in the trays. Splash drains and blocks – Directs water from the end of the downspout even further away from the building. 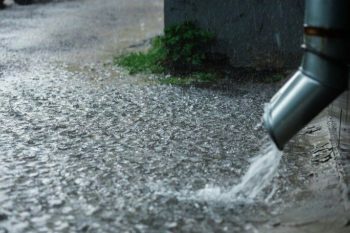 Flashing – A waterproof material that keeps water away from seams and intersections. Talk to us about how our process. We’re more than happy to work with you to come up with custom solutions for your roofing and gutter systems. For more information about our roof gutter replacement services, contact us today.